NOTE : This is a subscriber-only article that was made open for public viewership on 20 May 2016. Also, the Headwinds index, due to its stylized (as opposed to numeric) nature is very lumpy and thus recession probabilities can jump by large amounts moving from one headwinds level to the next. So whilst this model is showing elevated recession probabilities in 9-14 month time it does not constitute actionable information at this juncture. The HeadWinds index is but one of the 6 models in the RFE and that is precisely why we designed the RFE – to allow for input of multiple robust diversified models into determining recession. Even if the Headwinds index was to move to 6 and the model were to call recession, the RFE would only rise by 1, which still does not constitute actionable information other than maybe some modest hedging or de-risking activity. Another way to look at the RFE is to average the current recession probability showing on each of its six model components, which is currently showing a 14.6% probability of recession. This model appears to have served well in the past, with zero false positives above readings of 0.20. 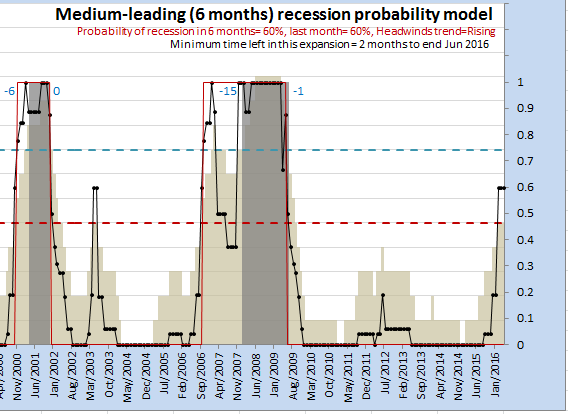 It is therefore true that recession probabilities are elevated, the highest they have been since this expansion started in 2009. In fact, we have been witnessing this quite emphatically with non-RFE components, with both the Weekly Leading Economic Index (WLEI) and more importantly, the new and comprehensive US Long Leading Index. But as the chart above shows, elevated probabilities only becomes concerning once the average RFE component recession probability is above 0.2. It is our suspicion that the recession probabilities will abate in coming months, purely based on the recovery we are seeing in the WLEI and the March bounce we saw in the new Long leading Index report published last month to the USLLGI reports tab. 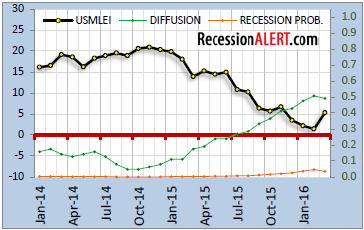 This leading index has over 50% of its 21 indicators in recession territory (green line below).